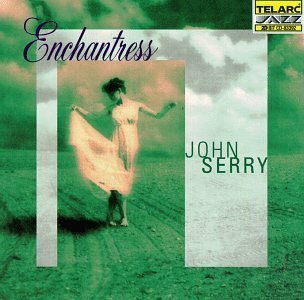 Pianist John Serry’s Enchantress (Telarc Jazz CD 8332; 62:09) offers a deceptively simple mix-a meditative, semi-traditional small ensemble album built around the acoustic piano. Serry’s fleet fingered runs on songs like the jaunty, catchy “DYT it” are both technically impressive and subtle, affording his melodies the opportunity to grow and wander. Just when you think you have Serry figured as a traditionalist, he throws a welcome curve-ball like the fusion timing/acoustic instrument contrast on “Precious” (which also features a great give-and-take between piping flute and doodling piano). Serry’s ballads are equally disarming-“Heartfelt’s” modern classical feel, with its gently clashing chords is warm and resonant without being over-arranged or heavy handed. Listen and prepare to be enchanted.